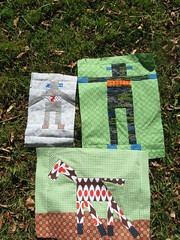 A few more blocks on the wish list for the boy’s quilt: bus, train and a car almost finished. We have a big birthday tomorrow….someone is six! Hopefully I can control 15 boys for two hours? I always used to look at quilts with perfect circles and wonder how they achieved the perfect symmetry and accuracy with their circles. At my sewing class I learned a little trick of the trade for sewing circles. Cut a cardboard template the size you want the finished circle. Cut a piece of fabric larger than the template to include the seam allowance. Cover the cardboard template with the fabric and cover with a piece of tin foil over the fabric and template and iron. This creates the perfect circle seams so you can then applique down circular seams. Who knew? Apparently a lot of people but not me! Here is a sneak peak at the new quilt in the works. The pattern is another Material Obsession quilt. I bought the kit two years ago at Darling Harbour and had no idea where to start. It looks easy on the surface, but a there is no real set pattern so there is a lot of working it out on your own. I am really enjoying it and can’t wait to put it all together. I just finished the girl version and will post some photos soon I promise! Today kicked off the hand quilting marathon to put it all together. A good slow burn project for me. Hope you get some time to sew as I am finding it hard at the moment to squeeze in. Off to wine and cheese taste tonight with girlfriends. Just hanging out to get there! 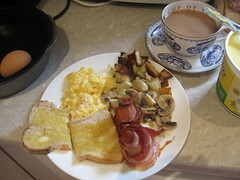 Breakfast fit for the best Dad in the world. A day off from the kids this afternoon so he can test out his new garden tools. Hopefully a great day for him. Happy Father’s Day to all those great Dads out there. We are on the home stretch of our building project. So much of my time has been devoted to the decisions so the Blog has been on the back burner. 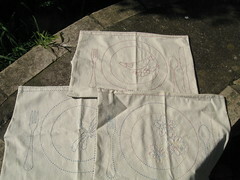 Sorry for the horrible photo quality of the placemats that are in progress. I just need to sew up the sides and I am making another three so everyone in the family can have one. I picked these up at Darling Harbour at the Be Be Japanese stand. I was seriously in love with their stand this year. 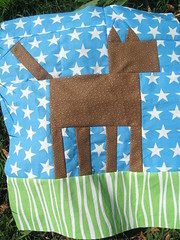 I also have a big post coming up on the quilt I have been working on for Sloan. I love it and can’t wait to share. I am still taking my class at Material Obsession and can’t believe how much I have learned this year from one class. If you have always wanted to take a class and haven’t like me, do yourself a favor and sign up! Inspiring!